This is the moment we’ve been building to. We’ve seen so many great teams, taking trips down memory lane with each of them to see what made them a special and unique champion. However, none of them compare to the champion we are going to look at today. 60 wins. 132 points. 33-1-6 home record. 9 Hall of Famers. Those are just a few things that this team accomplished and below we’ll look at even more. Some of the stats and facts we’ll throw out at you will have you rubbing your eyes in disbelief or questioning whether or not I made a typo. 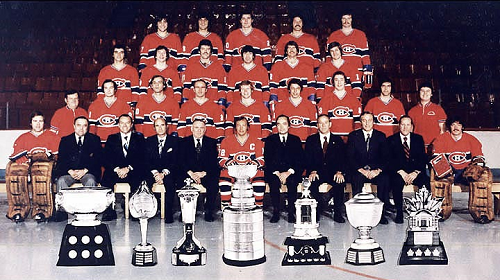 The #1 team in NHL history is without a doubt…..the 1976-1977 Montreal Canadiens. The 1975-1976 season saw the Canadiens finally end the run of the Broad Street Bullies, sweeping them 4-0 in the Stanley Cup Finals. Heading into the 1976-1977 season, the Canadiens made very little changes, with the only significant change being the return of Rejean Houle from the WHA. Coach Scotty Bowman had his team ready to go from the very first game. In the first game of the regular season, the Canadiens routed the Penguins 10-1. Just 3 games later, the Canadiens traveled to Philadelphia for a rematch of the Stanley Cup Finals, and they thumped the Flyers 7-1. This team was just ruthless. Fast forwarding to October 30th, the Bruins managed to knock off the Canadiens in Montreal, ending the Canadiens 5-0 start at home. Little did people know, that would be the only time Montreal would lose on home ice that season. More of than later. At the end of October, the Canadiens were 9-3-1, and had started off pretty good. The Canadiens averaged 5.1 goals a game in the first month of the season and gave up just 2.2 goals a game. The scary part for the rest of the NHL? The Canadiens kept us this pace for the entire season. The Canadiens ran through the month of November, going 10-1-2. The Canadiens then ramped up their level of play, if you can even imagine that, going 18-1-3 between November 17th and January 12th. In the worst “skid” of the season, the Canadiens dropped 2 of their next 3 games, bringing their record to 33-7-6 on January 17th. The Canadiens went 3-0-1 in their next 4 games to push their record to 37-7-7 at the All Star Break. What the Canadiens did post-All Star Break is the greatest post-All Star break run in the history of the NHL. The Canadiens went 24-1-5, earning 53 of a possible 60 points (88.3%) of the points possible. That post All Star break run included the Canadiens finishing the regular season on a 28-0-6 home unbeaten streak. Remember that game back in October when the Bruins knocked off the Canadiens 4-3 in Montreal? Yea I wasn’t joking when I said that was the last time they were going to lose at home for the season. The Canadiens finished the regular season with a 33-1-6 home record (90% of points possible), the best home record in NHL history. Want to make that home record seem even more impressive? The Canadiens outscored their opponents 205-75 at home (5.1-1.9). Take a moment to think about that. We’ll wait. Their overall record was 60-8-12, good for an NHL-record 132 points that only 1 team has even come close to (95-96 Wings, 131 points). The Canadiens won their division by a mere 49 points, their conference by 26 points, and were 1st overall by 20 points over the hated Flyers. Individually, the Canadiens were the most impressive team in NHL history in terms of the awards they captured. Guy Lafleur finished the regular season with 56 goals and 136 points (1st in NHL). Steve Shutt scored 60 goals to lead the NHL. The third member of “The Dynasty Line”, Jacques Lemaire, scored 34 goals and 75 points. Larry Robinson scored 85 points to lead all defensemen in scoring. Ken Dryden went 41-6-8 with a 2.14 GAA and 10 shutouts. Let’s look at the hardware this team collected. Of the 6 spots on the NHL’s 1st All Star Team, 4 were occupied by Canadiens (Ken Dryden, Larry Robinson, Guy Lafleur, Steve Shutt). The MVP and Art Ross went to Guy Lafleur. If the Rocket Richard existed, Steve Shutt would have won it. Ken Dryden and Michel Larocque shared the Vezina for giving up the fewest goals. Larry Robinson won the Norris Trophy as the league’s top defenseman. Scotty Bowman won the Jack Adams Award as the Coach of the Year. Finally, Lafleur also received the Lester B. Pearson award as the League’s Most Outstanding Player. As a team, the Canadiens put up some mind boggling numbers. The Canadiens were 1st in goals for (4.84). The next closest team was almost a full goal behind (Flyers 4.04). The Canadiens also finished 1st in goals against (2.14). The Canadiens had 8 20 goal scorers, 14 10 goal scorers, and 10 players finish with 50 or more points. The Canadiens finished the year 2nd in PP% at 24.9% and 1st in PK% at 87.9%. Finally, the most impressive stat from the Canadiens was their Even Strength For/Against numbers. The Canadiens finished that season with the highest number ever for a Stanley Cup Champion, at 2.31. This team could do everything. Let’s look at their playoff run. The first round of the playoffs saw the Canadiens matched up against the St. Louis Blues. The Blues went 32-39-9 in the regular season and were heavy heavy underdogs. In the regular season, the Canadiens won the season series 3-1, and outscored the Blues 20-11, with 7 of the Blues goals coming in the 1 game they won. Their playoff series was absolutely no different. The Canadiens destroyed (and destroyed may not be a strong enough word) the Blues in a 4 game sweep. In the 4 games, the Blues managed to score just 4 goals, and the Canadiens scored 19. The Blues really had no chance in the series and the Canadiens showed just how big of a gap there was between them and the rest of the NHL. In the 2nd round were the New York Islanders. The Islanders had managed to fight their way to the 2nd round after sweeping the Blackhawks 2-0 in the preliminary round, and then sweeping the Buffalo Sabres 4-0 in the 1st round to set up a matchup with the Canadiens. The Islanders went 47-21-12 in the regular season and were a very good young team. The Islanders were led by Denis Potvin and Bryan Trottier and hadn’t yet drafted Mike Bossy, the third player who would put them over the top in the early 80’s (they would actually draft Bossy in the draft following this season). However, they were still good enough to put a scare into the Canadiens if they were too casual. Montreal came out of the gates hot and took control of the series, taking Game 1 4-3 and then following that up with a 3-0 shutout in Game 2. However, the Islanders weren’t ready to quit and won Game 3, 5-3. Those 5 goals in Game 3 were the most goals the Canadiens gave up that entire playoff run. Game 4 was pivotal. If the Islanders took it, the Canadiens knew that they would be in a dog fight, so they needed to bring their “A” game. Ken Dryden was up to the task. Dryden posted a 4-0 shutout to give the Canadiens a commanding 3-1 series lead. The Islanders would manage to steal Game 5 in OT, but instead of feeling like they were back in it, it seemed more like the postponement of the inevitable. The Canadiens put the Islanders out of their misery in Game 6, winning 2-1 to send the young Islanders home. Awaiting the Canadiens in the Stanley Cup Finals were the Boston Bruins. The Bruins finished the regular season at 49-23-8 for 106 points. The Bruins were led by 36 year old center Jean Ratelle who scored 33 goals and 94 points that season. In the regular season, the Bruins were the only team to hold a winning record against the Canadiens, going 3-2 against the Canadiens in the regular season, and being the only team to beat the Canadiens at the Forum. However, we are talking about the greatest team in NHL history and there was no way they were going to be intimidated by losing the regular season series to the Bruins. In Game 1, Montreal came out and made a big statement. The Canadiens scored 4 goals in the first period en route to a 7-3 thrashing of the Bruins. Game 2 was no different, as the machine-like Canadiens scored 1 goal in each period on their way to a 3-0 shutout of the Bruins. After giving up 20 goals in the 5 regular season games against the Bruins, the Canadiens had allowed just 3 goals in the first two games and were determined to keep up the defensive intensity heading back to Boston. Game 3 saw the machine keep rolling as Lafleur recorded a goal and 2 assists in the first period on his way to a 4 point night, leading the Habs to a 4-2 win. Knowing that they would need their best effort to even steal one game from the Habs, the Bruins brought the kitchen sink with them to Game 4. In Game 4, the Bruins scored first for the first time all series, as Bruins winger Bobby Schmautz scored on a shot from the point when Ken Dryden had lost his mask. Back in the day, if a goalie lost his mask, play did not stop, and Dryden was still expected to make the save. In the 2nd period, Jacques Lemaire brought the Habs even, as Lafleur found Lemaire wide open in the slot and he beat Bruins goalie Gerry Cheevers high glove side. The Canadiens kept coming in waves after that, but Cheevers stopped everything that his came his way. The game went into OT tied at 1. After a chip in deep by Guy Lapointe, the Habs pressure forced a turnover. Lafleur stole the puck and as he was skating behind the net, he spotted Lemaire parked right in front of the goal. Lafleur hit him with a pass and it was an easy tap-in goal. The Habs were the Stanley Cup champions for the 2nd year in a row. Lafleur won the Conn Smythe for his 8 points in the Stanley Cup Finals. That’s the story of the 1976-1977 Montreal Canadiens, the greatest team of all time. We’ve already illustrated several different reasons as to why the 76-77 Habs were the greatest team of all time, but I’ll try and reinforce it here. Their 60-8-12 record is the best in NHL history. Their 33-1-6 home record is the best in NHL history. Their +2.7 goal differential was the biggest goal differential in NHL history. Their + 130 goal differential at home (+3.25 a game) is the greatest in NHL history. They had 9 Hall of Famers without including Coach Scotty Bowman. They were #1 in goals for, #1 in goals against #2 in PP%, #1 in PK%, and #1 in Even Strength Goals For/Against. Their 24-1-5 post All Star Break record is the best in NHL history by a wide margin. That season the Habs had the best player, the highest point scorer, the highest goal scorer, the best defenseman, the best goalie, the most outstanding player, the best coach, and the best player of the postseason. What more do you want? The 1976-1977 Montreal Canadiens are without a doubt, the greatest team in NHL history and that’s why they have the #1 spot in our countdown of the Top 15 NHL Teams of All Time. So there you have it. Thanks for reading and keeping up with the countdown and if you have any questions, comments, or concerns about the article, please don’t hesitate to contact me.